O PIETTO FORTE VINCE A MALA SCIORTA! Naples from the vintage.it point of view: a city with a strong heart, a place where life can be hard but people are still positive. 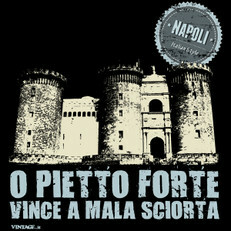 The sentence on this italian vintage t-shirt means "a strong heart can win on a bad luck!"